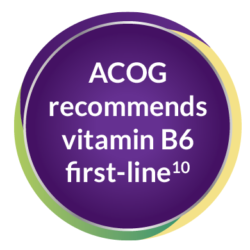 Vitamin B6 is a non-pharmacological method to help ease common morning sickness and the first-line recommendation to reduce nausea and vomiting from ACOG (American Congress of Obstetricians and Gynecologists).9,10 Vitamin B6 is a valid option to those who prefer to refrain from taking nausea medication. Vitamin B6 has long been known to be a natural remedy to help ease nausea, especially in the first trimester when morning sickness is most prevalent. PrimaCare™ contains the most vitamin B6 of any other prescription prenatal supplement on the market.1-7 The 50 mg of vitamin B6 found in PrimaCare™ allows you to enjoy your pregnancy by helping to manage your common morning sickness. References: 1. Primacare™ prescribing information, Avion Pharmaceuticals, October 2016. 2. Prenate Mini® Prescribing Information, Avion Pharmaceuticals, January 2015. 3. Citranatal Harmony® Prescribing Information, Mission Pharmacal, November 2016. 4. Citranatal Assure® Prescribing information, Mission Pharmacal, November 2016. 5. Citranatal® 90 DHA Prescribing information, Mission Pharmacal, November 2016. 6. Vitafol® Ultra Prescribing Information, Exeltis Pharmaceuticals, March 2015. 7. Concept DHA Prescribing Information, US Pharmaceutical Corporation, March 2017. 8. Ebrahimi N., Maltepe C., Einarson A.,Optimal management of nausea and vomiting of pregnancy. Int J Womens Health. 2010; 2: 241–248. 9. Practice guideline briefs: Nausea and vomiting in pregnancy. Am Fam Physician. 2004; 70(3):601 10. Morning sickness. Pregnancy FAQ 126. ACOG website. http:// www.acog.org/-/media/For-Patients/ faq126.pdf?dmc=1&ts=20150426T2004343387. October 2012. Accessed Dec 6, 2016.